Polycab IPO is all set to open on 5 April 2019. The company is a manufacturer and seller of wires and fast moving electrical goods. The company is offering nearly 2.5 crore equity shares at a price band of Rs 533-538. Some of its promoters, including the World Bank’s lending arm International Finance Corporation, will sell the stake in the IPO. It will be a combination of offer-for-sale and fresh issue. Besides wires and cables, the company also manufactures FMEG Such as electric fans, LED and luminaries, switches, and switchgear, solar products and conduits and accessories. The Polycab company sells its product under the brand name “Polycab”. The company is one of the largest manufacturers of wires in the industry. The other business includes electric fans, LED lighting and luminaries, switches and switchgear, solar products and conduits and accessories. How to Apply Polycab IPO? The company came into existence in the year 1996. The company is indulged in manufacturing and selling of wires and fast moving electrical goods under the “Polycab’ India. The polycab manufacture and sell a diverse range of wires and cables and our key products in the wires and cables segment are power cables, control cables, instrumentation cables, solar cables, building wires, flexible cables, flexible/single multi-core cables, communication cables and others including welding cables, submersible flat and round cables, rubber cables, overhead conductors, railway signaling cables, specialty cables and green wires. In the year 2009, the company diversified into the engineering, procurement, and construction (“EPC”) business, which includes the design, engineering, supply, execution, and commissioning of power distribution and rural electrification projects. In 2014, we diversified into the FMEG segment and our key FMEG are electric fans, LED lighting and luminaires, switches and switchgear, solar products and conduits and accessories. The company has 25 manufacturing facility. The company was later on converted into a private limited company as ‘Polycab Industries Private Limited’ under the Companies Act, 1956. Polycab Industries Private Limited was subsequently amalgamated with the Company in 2011. IPO is an acronym of the initial public offering. Prior to, an IPO the company is considered to be private, with a relatively small number of shareholder made up primarily for early investors such as founder, their families, and friends. The procedure of offering shares in a private corporation to the public for the first time it is called initial public offerings. 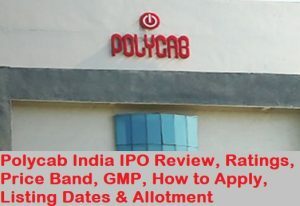 The opening and the closing date of Polycab India IPO is Apr 5, 2019 – Apr 9, 2019. Here, you can refer the table to know the allotment status of this IPO. What are Financial Highlights of Polycab? The company’s net worth as on 31s of Dec. 31, 2018, was Rs 2,723 crore, translating to a book value of Rs 183 Per share after the issue of new share. The company’s net profit grew 42.7 percent in the same period. For the first nine months of the financial year 2018-19, the company reported revenue and a net profit of Rs 5,507 crore and Rs 358 crore, respectively. The company had a debt of close to Rs 620 crore as of Dec. 31, which would reduce to Rs 540 crore once the company uses part of the IPO proceeds to repay debt. If you have a demat account, most banks offer the online IPO application. You can also contact the broker to apply in Polycab IPO. Most banks including the ICICI bank, Axis and Kotak bank allow the customer to apply in IPO using the demat account. How to Apply Polycab IPO Through ASBA? Who are the Polycab company promoters? Note: Check Polycab IPO allotment status on Karvy website allotment url. The Polycab India IPO Grey Market Premium price is Rs 75-80, the Kostak rate is Rs 600 and the Subject to Sauda is X. The IPO price and bands dates will be added as it will be officially announced. During the session on Monday, the second day of issue, the Polycab India IPO has touched around 1.70 crore bids, marking a subscription of 96.18 percent, as per the data available with the NSE till 12:15 pm. The Polycab IPO received a total of 52.94 lakh bids at the cut-off price at the time. Subscription at cut-off price means that investors consent to purchase the shares at the offer price as determined the end of the book-building process. A price band of Rs. 533-538 piece has been set for the Polycab IPO. 4. Shares under the Polycab IPO can be subscribed in the lots of 27 units. This means that investors can subscribe to the IPO at a minimum of Rs. 14,391-14,526. 5. Mumbai-based Polycab India is engaged in the business of manufacturing and selling of wires, cables, and other electrical goods. Meanwhile, state-owned Rail Vikas Nigam’s IPO to raise Rs. 482 crore was subscribed 1.8 times last week. Why you should apply for Polycab IPO? Bankers to the Company – State Bank of India, Bank of India, Industrial Development Bank of India, Punjab National Bank, Standard Chartered Bank, Citibank N.A. I hope you had a great time reading about the “Polycab IPO Analysis” After considering all the factors should you invest? If you find the above info on Polycab IPO review useful then please do share it among investors and other interested users. We at Investor academy aims at delivering useful information to the users and others. Also, if you any queries or doubts pertaining to this please do share it with others. As an Investor one should be vigilant and take a well-informed decision. Always remind yourself that Risk comes from not knowing what you are doing. Last, but not least, do not forget to like and subscribe to us. Best Discount Broker in India? How to Invest in Share Market? Mutual Funds Basics What is a Fixed Deposit?